Thanks to support from the University of Liverpool’s Interdisciplinary Research Fund, Dr Alex Buchanan, Dr Nick Webb and JR Peterson have spent two days at Exeter Cathedral scanning the medieval vaults for their project Modelling Medieval Vaults, which aims to use digital analysis to reconstruct the methods used by medieval masons when designing and constructing these complex three-dimensional forms using compasses and string rather than computer-aided design. 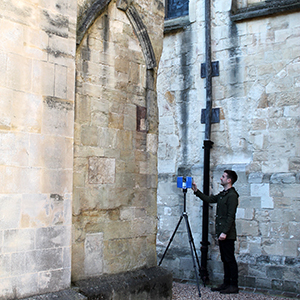 The photo shows Nick with the scanner, which captures data at up to 1mm accuracy in the form of a ‘point cloud’. The scanner uses a laser beam, reflected off a spinning mirror, which creates a virtual dot or point every time it hits a solid surface. These dots create a three-dimensional model, which reveals the general shape of the vault. Further manipulation of this data, including painstakingly joining dots to form lines enables the creation of more linear models, which are more useful for geometrical analysis. 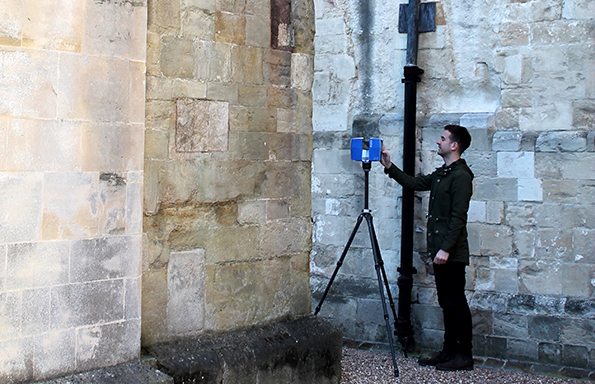 The area here being scanned was once the North walk of the Cathedral’s cloister, erected after 1328 along with the South aisle of the Cathedral nave. Although the cloister was demolished in the seventeenth century, scars remain on the walls which show the shapes of the arches where the vault met the wall. These provide clues for reconstructing the three-dimensional form of the vault, which will be the next stage of the research. Excavation by Exeter Cathedral’s archaeologist, John Allen has demonstrated that although the two arches on each section might imply a vault with a central pier, no such supports existed. This suggests that the vaults had a domical form, with the centre point rising higher than the side arches. This is a highly unusual form, but analysis of Wells Cathedral, scanned as part of the same project in 2015, has found domical vaults in the south choir aisle. This parallel is particularly interesting because both sites are associated with the same named masons, Thomas of Witney and William Joy. The scan data can therefore be used to make detailed comparison between the two sites, helping to create new understanding of their respective roles in exploring and developing the possibilities of three-dimensional design.